Fun With Frisian: KEAR - "turn, time, times"
KEAR - "turn, time, times"
This entry is actually a bit sequential, following after the last lesson on elk and elts. Today, we turn to kear, a multi-faceted West Frisian noun that can mean "turn," "time," or "times," among many other things. What other things, you may wonder? Examples include: a stop or a detainment, a change, fields into which a pasture is divided, a card, or a cradle. Let's spare ourselves a headache and focus on one meaning at a time. (To make matters even more complex, there is a verb keare with its own set of meanings). Ik is Frisan for "I" and is said with an "ih" as in the English "wick." IHK. Sjoch takes the -ch- we've seen before, that throat-clearing sound heard in the German word Bach or the Hebrew l'chaim. The vowel is a rounded "oh" as in "boat," preceded by a gliding -y. SYOHkh. 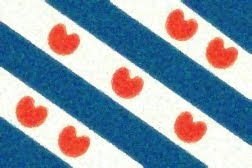 Dy sounds like "dye," the same sound we often see with Frisian words spelled with an ei. Hear, it is an informal "you." Modern West Frisian, like many languages, distinguishes between the formal and informal "you." Remember that if you hear this word, it can also mean "day," but the spelling would by dei. DIGH. Hear is said with an "ih" vowel and a schwa that may get somewhat buried in speech. It ends up sounding pretty close to the English word "hear." HIHr. Fiel is conveniently pronounced like the English word "feel." Eltse is the word you will remember from the previous lesson. Elts or elk mean "every" or "everyone." It takes the "eh" vowel heard in the English word "elk" and ends with a schwa. EHL-tsuh. Kear is--like hear--pronounced with an "ih" vowel and a schwa. KIHr. Opnij is from the words op, meaning "on," "upon," or "up" and the word nij meaning "new." Say op with a round "oh" as in the English "hope" and say nij like the English "nigh." OHP-NIGH. A quick observation on the title of the song: this can be a bit confusing when starting out, but some phrases taking the nominative form of the informal "you," do (pronounced like an English female deer) combine words and drop the d-. Wêr bisto would be wêr bist do, but it is shortened. Likewise, as do meaning "as you" becomes asto. You can listen to the song and follow along with the lyrics here.